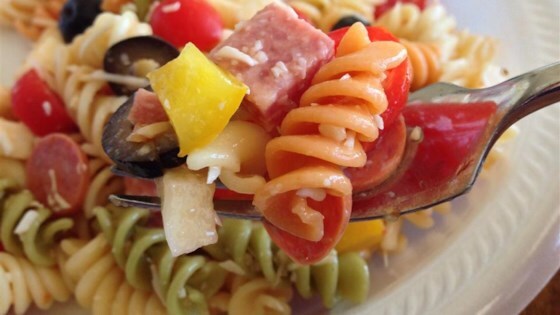 "This is the best pasta salad I've ever eaten, and people request it frequently. It's a very easy, light-tasting side dish for a picnic or dinner." Bring a large pot of lightly salted water to a boil. Add pasta, and cook for 8 to 10 minutes or until al dente. Drain, and rinse with cold water. In a large bowl, combine pasta with tomatoes, cheese, salami, pepperoni, green pepper, olives, and pimentos. Pour in salad dressing, and toss to coat. This had promise, but there was not nearly enough dressing. Came out kind of flavorless. If I made it again, I would use a full 16 oz of dressing. Hormel makes a bag of mini pepperoni's that are so cute and perfect for this salad.